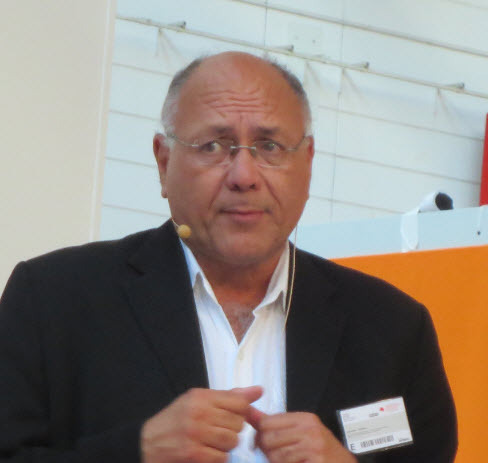 Robert Kasher of Firstsource and digi-EXPress speaks Thursday about publishing rights at Frankfurt Book Fair. Robert Kasher of Firstsource/digi-EXPress is a rights consultant whose presentation at Frankfurt Book Fair last week focused on the increasingly complex issues of publishing contracts executed prior to the digital era and the process of automating new databases of such rights today. Over time, Kasher said, a wide diversity of approaches to the clearance of rights and how they’re handled has developed in the industry. “Some publishers have authors do the rights,” he said. “Other publishing companies have their editorial staffs clear rights. And still other publishers may have their rights and permission people—acting on behalf of authors and editorial personnel, handle those rights issues. “What we recommend and, of course, what we have developed over the years is a cloud-based solution. It lets you essentially put your rights database into the cloud, make it available and visible to all the different stakeholders within the company, integrate that with other digital marketplaces that already exist, such as Getty Images, the Motion Picture Association of America. And then be able to acquire and sell rights online either through these various marketplaces or by something as simple as being able to email your contact list off of a global database managed by your company. As difficult as it may seem to get a company’s database digitized and onto the cloud for full accessibility, Kasher cautioned, not moving in this direction can be costly. “There’s an enormous amount of revenue staying locked up in your contracts right now,” Kasher said, if they haven’t been digitized and made accessible to the right people.